Please use the Dresden page . The Rutgers page is not maintained. Condensed Matter Theory --- the study of coherence and correlations in many-particle systems. topological order and other unconventional ordering. Postdocs interested in working on any of these topics: please contact me by email. Most of my papers are available as preprints on `cond-mat' at www.arxiv.org. Philip Cussen Burke; PhD student. Yulia Shchadilova; PhD student in Moscow, frequent visitor. Kush Saha; visiting PhD student (autumn 2012). Brief descriptions of selected research topics. Worked on entanglement spectra in 1D and 2D lattice systems. Arxiv links: paper 1, paper 2, paper 3. Papers from later collaboration: paper A. paper B.
Wouter Beugeling (postdoc) October 2012 - January 2015. Worked on statisitcal properties of many-body eigenstates, motivated by non-equilibrium dynamics (e.g., Eigenstate Thermalization Hypothesis). 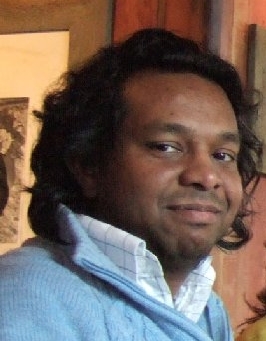 Shreyoshi Ghosh / Mondal (postdoc) September 2012 - December 2013. Worked on non-equilibrium dynamics of the ``impurity screening cloud'' (analog of the Kondo cloud) in impurity models. Arxiv links: paper 1, paper 2. Paolo Mazza (PhD student) August 2014 - July 2015. Alexey Mikaberize (at the time: PhD student in the MPI-PKS Finite Systems Department) 2008. We did some work on theoretical ecology, not related to my main research. Based on this work, Alexey moved to a career in theoretical ecology after his PhD in atomic/laser physics. Ricardo Pinto (PhD student with Sergej Flach) 2008. Eoin Quinn (postdoc) August 2013 - summer 2014. Sthitadhi Roy (PhD student) August 2013 - present. Worked on non-equilibrium dynamics in Chern-band models, e.g., the Haldane model. Visited MPI-PKS September - November 2012 to work with me. Worked with me during multiple visits to MPI-PKS, from summer 2012 until spring 2014. (2) low-density versions of Kondo models (arxiv link). Worked on non-equilibrium dynamics in Bose-Hubbard systems. Arxiv links: paper 1, paper 2, paper 3, paper 4. Visited Dresden for several weeks in 2011. Jacopo Viti (postdoc) October 2014 - January 2016. Summer 2009: T. Venumadhav, visited Dresden from I.I.T. (Kanpur, India); 10 weeks. Venumadhav went to pursue doctoral research at Caltech. February-July 2009: S. Piatecki, visited Dresden from ENS Paris; 5 months. Research on geometrically frustrated itinerant systems, later concluded in collaboration with L. Jaubert. Piatecki went on to pursue doctoral research at ENS Paris. Summer 2010: A. Balram, visited Dresden from ISERC (Pune, India); 3 months. Balram went to work for his PhD at Penn State University (Pittsburgh). Summer 2011: S. Chatterjee, visited Dresden from I.I.T. (Kanpur, India); 10 weeks. Summer 2016: Zhiyu Dong, visited Dresden from Fudan University (Shanghai, China); 10 weeks. Research on non-equilibrium dynamics of a classical gas. made possible by generous funding from the Wilhelm und Else Hereaus-Stiftung . This workshop brought together theorists addressing non-equilibrum quantum physics from two different perspectives: namely, the perspective of exact unitary dynamics, and that of quantum kinetic descriptions in the framework of the Boltzmann equation or its generalizations. Meeting organized in June 2010. Focus workshop, November 12-16, 2012. I am currently a faculty member at Maynooth University, in Ireland, in the greater Dublin area. I am in the Department of Mathematical Physics. From late 2006 to early 2016, I was a research scientist at the Max-Planck Institute for the Physics of Complex Systems (MPI-PKS) in Dresden, Germany. I was associated with the Condensed Matter Department within MPI-PKS. For part of my time in Dresden, I held a ``Distinguished PKS postdoctoral fellow'' position; one of three such positions at the MPI-PKS. Later, as a longer-term Staff Scientist I directed a group of researchers (of varying sizes at various times), mostly focusing on the physics of quantum systems out of equilibrium. I did my Ph.D. at the Physics Department in Rutgers University, New Jersey. I was at Rutgers from Fall 1997 till September 2003. I worked with the Rutgers quantum condensed matter group and my PhD advisor was Andrei E Ruckenstein.